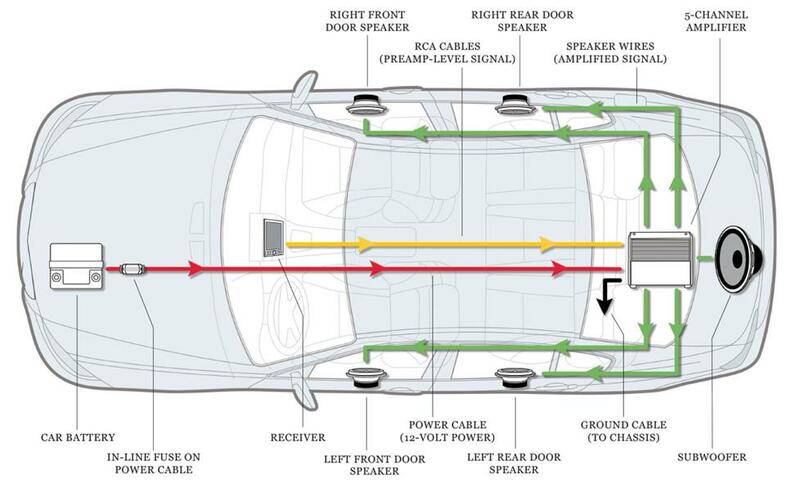 Looking for the perfect audio setup for your car? Keep on reading the rest of this Sound Systems for Cars: A Guide on What you Will Need and we will provide you with insights on the different components that will be needed for your car stereo sound system. While there are many who already seem to be contented with their original setup, for the more discerning people, especially for audiophiles, it is a must to install aftermarket systems. What exactly will be needed to complete your car audio setup? Below, we will identify some of the necessary components that are included in car audio system packages. Each of these should be chosen carefully to be sure that they will complement each other, and in the end, be able to produce an astounding sound experience inside your car. This is one of the most important components that should be included in car stereo system packages. The factory-installed head units are already equipped with an amplifier, but the problem is that they are small, and hence, won’t be able to deliver powerful reproduction of sound. This is the reason why people resort into aftermarket amplifiers. They are larger and more powerful. They also provide more volume and character to the sound that is produced by the stereo. It is also added because it can provide the power that is needed by a subwoofer. Looking for the best amplifier that can be integrated in your car stereo with speakers will not be an easy feat. You need to have a bit of technical knowledge in order to determine which one is the right choice. Among others, one of the first things that you should do is to determine the channel configuration, which is in reference to the number of speakers that it can power. You also need to take a look at the power ratings of the amplifiers, which will have an impact on its performance. Power is expressed in wattage per channel. Generally speaking, if you want a more powerful output, choose a more powerful amplifier, which will result into a boost in volume. Nonetheless, keep in mind that you also have to take into consideration the compatibility of the amplifier with your car speakers to be sure that the latter will be able to handle the power of the former. If not, sound can end up being distorted. You also need to make sure that you use other components that are compatible with your chosen amplifier. For instance, determining the wire gauge and auxiliary battery will be a prerequisite. If they are not suitable for your amplifier, sound quality will not be improved. It can just worsen. Your audio setup will not be complete without the right speakers. Factory-installed speakers are cheap and they lack power, which is why having them replaced is a must if you want superior quality for your stereo system for car. If music seems to be lacking life, it can be because of having inferior speakers installed in your car. Speakers are important because they influence the quality of the sound. It may seem distorted if you have the wrong speakers. When looking for the best car speakers, there are different factors that should come into play. For instance, you have to make sure that it is compatible with your system. One of the technical specifications that should be looked at would be sensitivity, which will be a measurement of how much the speaker will be able to yield the power that will be forced upon it. For low-powered stereo systems, higher sensitivity rating is compatible. On the other hand, for high-powered car stereo, lower sensitivity rating is the best. Power handling is another important factor that should be taken into consideration. Basically speaking, this is in reference to the maximum power that can be handled by the speaker. If you have a powerful system and amp, you will also need to have speakers that can deliver the same power. Aftermarket speaker system for car can be generally classified into two. The first is full-range speakers, which means that all of the components are already included in the package. They are usually cheap and the sound quality is not as superior as its counterpart. For those with more discerning preferences, they opt for component speakers. In the case of the latter, the parts are separate from each other and they work together to create an astounding sound output. When installing the speakers in your sound system, there are also other accessories that you might need. For instance, it is common for most people to use Dynamat, which will help in lessening the noise levels and improving the clarity of sound. Foam baffles can also be used to protect your speaker from dust and other external elements that can be potentially damaging. Without a subwoofer, you will notice that the sound appears thin inside the car. The louder you turn up the volume, the more it will hurt to hear. With a subwoofer, this problem can be resolved. Essentially, it can be seen as a loudspeaker that can effectively reproduce bass. Regardless of the type of music that you are listening to, a subwoofer can be an excellent addition to sound systems for cars. When looking for the best subwoofer, one of the first things that you should do is to assess the amount of space that is available in your car. If you have a sedan or a small car, it would be best to install the subwoofers on the rear shelf. The spare tire chamber can also be a good choice. If you have a larger car, consider yourself lucky as you can place the subwoofer wherever you want to have it installed. You also need to consider the compatibility of the subwoofer with the other components of your car audio system. For instance, you need to take a look at the amplifier that you have. Take a look at the technical specifications of both the components and see to it that they will work well with each other. Aside from choosing wisely, it is also important to be mindful of how subwoofers can be properly used. Overtime, they can be damaged and blown up. One of the things that could lead into the latter would be having it overpowered. With this, make sure to play music only based on the power level that can be handled by your voice coils and your subs. See to it as well that it is installed with the use of the right components, especially the wires. The car stereo head unit is another important component of your sound system. This can be considered as the brain of the entire system as it serves as the command center. Most people call this the car stereo or the car radio. It dictates the functionality of the audio system. It has all the controls that are necessary. Many factory-installed head units are simple in terms of appearance. They can be replaced with modern and feature-rich alternatives, including those that have touchscreen interface. As you select the best head unit that is available in the market, you have to take into consideration the different features that will be needed. Many of them have a CD player and radio. A Bluetooth feature is also essential, making it possible to have it connected wirelessly to your smartphone, which is especially useful when it comes to playing music while you are on the road. Also, pay attention to the display. If there is a touchscreen, see to it that it has excellent contrast and that it will be easily visible. Having a steering wheel remote is also a good thing for ease of control, such as when making volume adjustments. Speaker Wires: This is important because it will serve as the electrical connection between the speaker and the other components of your audio system. Selecting the right gauge or thickness is one of the most important things, which will make sure that it can handle the power requirements. RCA Cables: They are two or three-color coded connectors. They will be used for the transmission of analog signals to the different parts of the audio system, such as your speakers. Car Battery: If you have a high-performance audio system, take note that it can easily consume the battery of your car. With this, for most people, they consider the possibility of adding a second battery that is meant specifically to provide the power that is needed by their audio systems. The large wattage of the amplifier and power of the subwoofer, among others, will demand a high-powered battery. In-Line Fuse On Power Cable: This is an essential for being able to safely wire your amp. The inline fuse should be installed in between the power cable and the battery. Take note that it should be placed on the power cable and not directly on the amp. Ground Cable: Your amp will need the right size of the ground cable, which should be large enough in order to provide the power that is needed. The use of the wrong ground cable will inevitably lead into problems with your amplifier. Car Stereo Installation Kits: This will be inclusive of all the things that you will need to successfully complete the installation of stereo system for car. The choice of which will depend on the specific type of car that you have or the system that will be installed. They will include the brackets and mounts that will be required. Indeed, sound systems for cars will be an incredible investment for anyone who is looking for a different kind of experience. Whether it is your daily trip to work or when on a road trip with friends, having excellent sound can make a lot of difference. It is now time to upgrade your audio setup! Consider the components mentioned above and it will be easier for you to come up with a stereo system that will make your friends envious!